November | 2014 | Love Those "Hands at Home"
I know that must’ve come as a shock to you, when I revealed it last month, but it’s true. And you know what? People love me, in spite of my imperfections! No, really, they do–they think I’m good enough. The imperfect dishtowel I told you about is finished and it’s still imperfect. 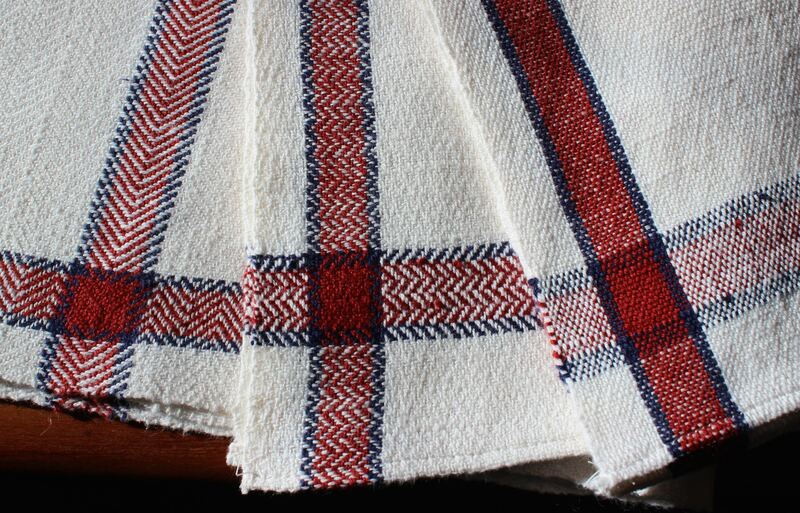 In fact, I had threaded my loom in such a way, with a long enough warp, that I am now the proud maker/owner of three imperfect dishtowels. And, you know what? I love them, in spite of their imperfections! No, really, I do! I think they’re perfectly good. I learned a lot from making them. I learned new things about weaving and the possibilities. 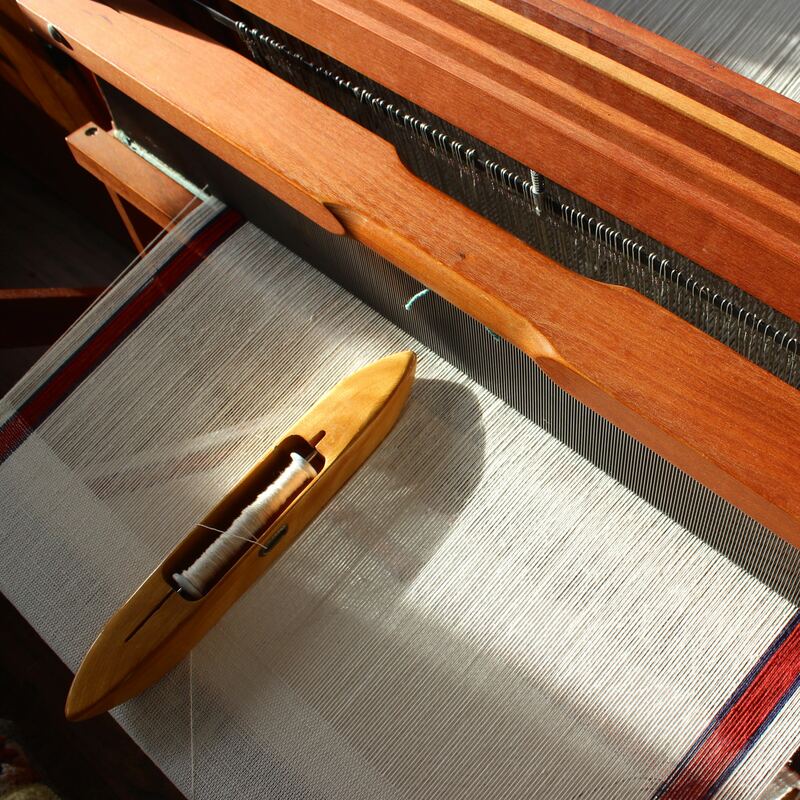 The loom is threaded one way but, by pressing different treadles in different orders, I could weave three different patterns. It shows up most clearly in the striped colors but is also really pretty in the texture of the white. I learned that it really is important to fix mistakes when you notice them. I made at least three threading errors in my towels. I knew one of them was there from the start and thought it wouldn’t be noticeable. Now I know better! I learned I really like this fiber. It’s called Cottolin and it’s a mix of cotton and linen. 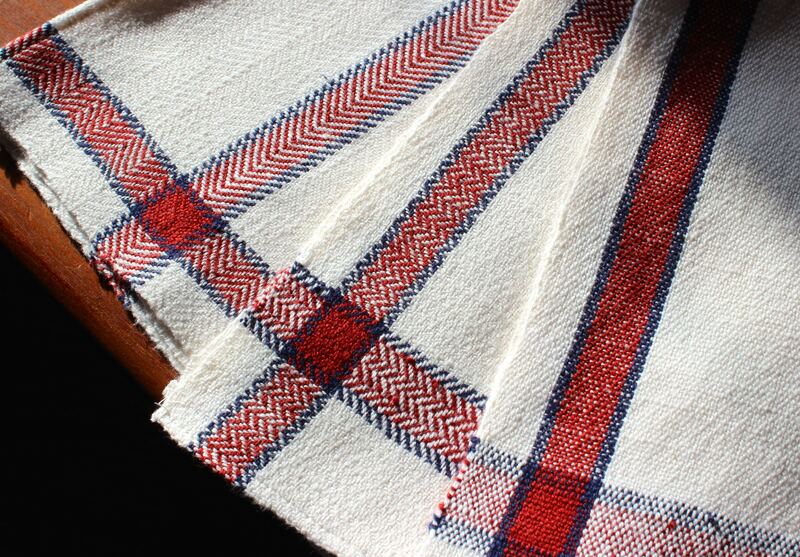 I’m told linen, by itself, can be difficult to weave but mixed with cotton it was very satisfying. I learned that cotton and linen shrink a lot, especially in length. I had intended, and thought I had planned for, these towels to measure 26 by 18 when finished but the biggest one ended up 22 by 20 . . . Hmmm, and I’m just now learning that I must’ve done something very wrong from the start, if I thought the towels would be 18 inches wide and they ended up 20. That can’t be explained by shrinking! I guess I’ve learned that I need to pay more attention to the math aspects of the planning stages! 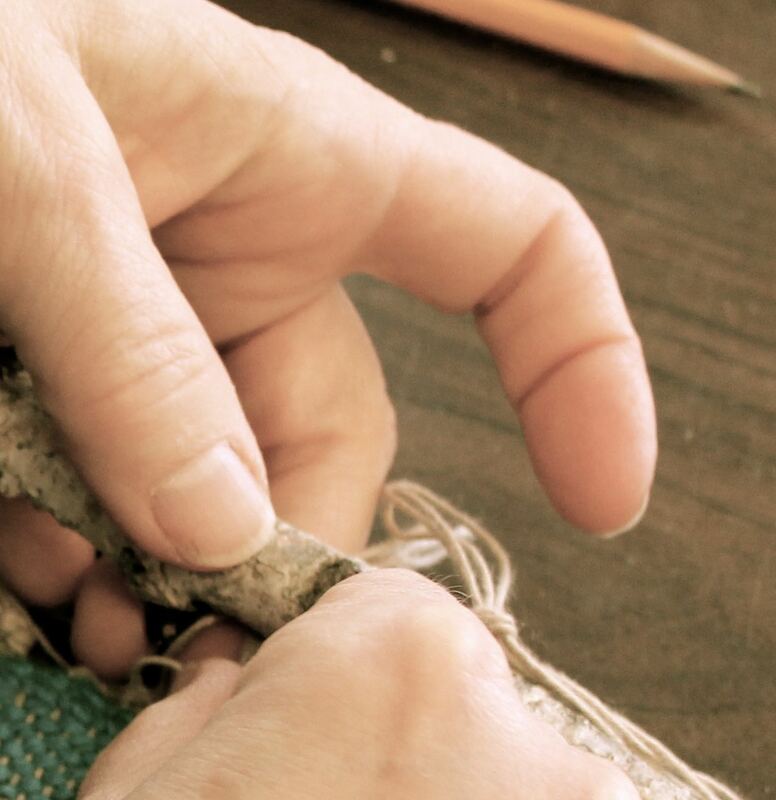 I learned, or realized again, that weaving feels like a certain kind of magic. 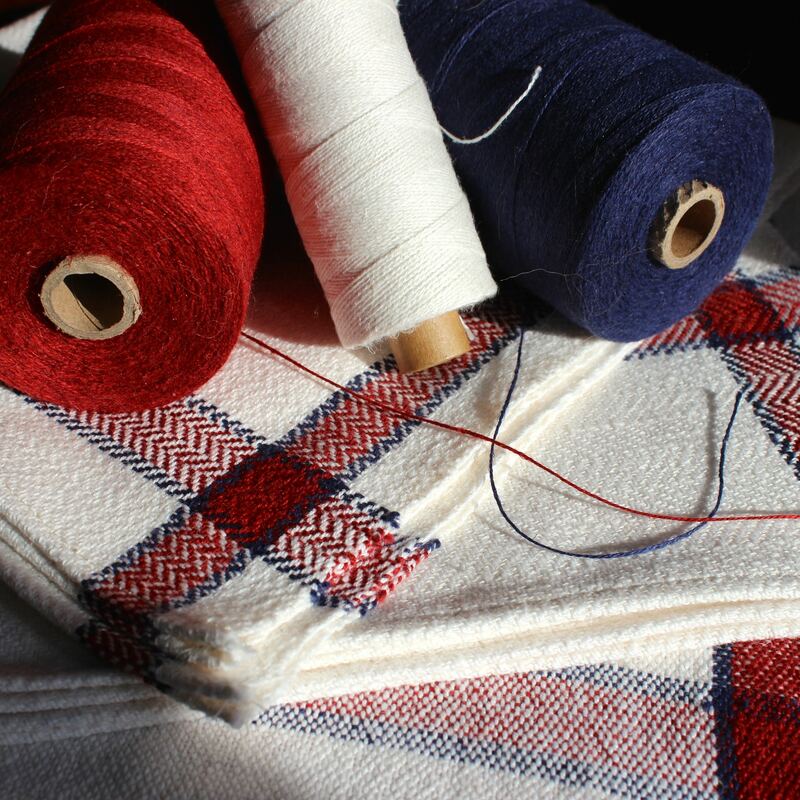 You start with thread, just endlessly long, boring thread, and create a web of fabric that is full of possibilities. I made dishtowels but I could’ve made cloth for a dress, a blanket for a baby, a coat for my cat, placemats and napkins for my table, a tapestry to celebrate a victory, a christening gown, a shroud . . .
And the fabric I wove makes me appreciate fabric like I never have before. 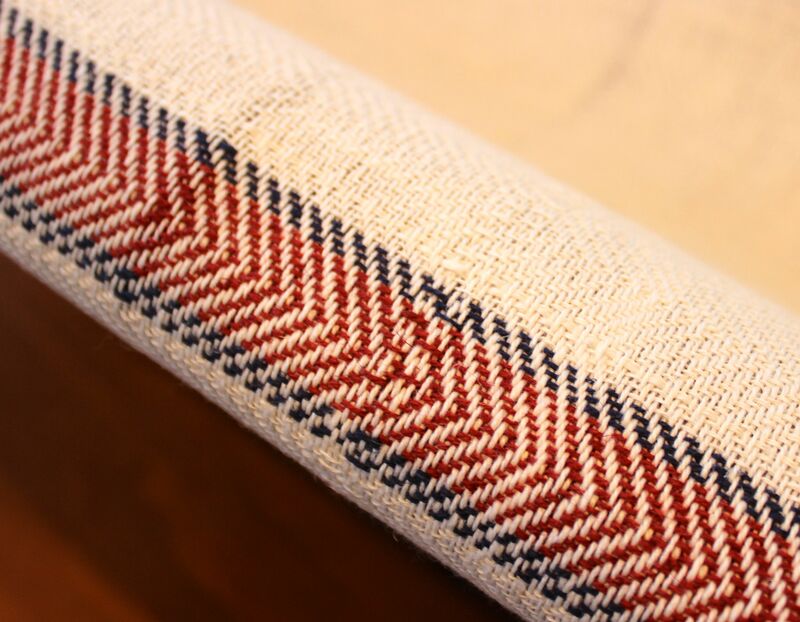 Weaving anything gives you a sense of why, historically, fabrics were treasured and treated with care and patched and re-used. This is an appreciation that gets lost when all our fabric comes from mills in foreign lands. My towels are imperfect but they will accomplish, perfectly, the purposes for which they were created. They have already taught me a great deal. They will be absorbent and will hold up to rough treatment. They will stand up to a hot washer and dryer and be ready to serve again. They will age beautifully and last long and make me smile when I use them. And they offer an important reminder to us all—we don’t need to be perfect to be perfectly good! A folklorist, traveling in rural America, meets an elderly farmer. The old man is tired, from hard work with his herd and his land, yet works in the evening to make chairs he needs for his home. The chairs he has crafted could be considered finished—they are strong and sound—but the old man continues, with weary hands, to carve flourishes and curlicues into the wood, to decorate his utilitarian creations. I heard this story, told by folklorist Henry Glassie, many years ago as an undergraduate when Glassie came to visit my college. Since then, I have thought often of the story, the old farmer, and his desire to create beauty and to please himself. The fact that this story, and none of the others Glassie undoubtedly told, has stuck with me suggests to me that it touched a nerve with me, even as a young person just starting to make things with my hands. It seemed, and still seems, so profound to me. In my painting classes, I was taught to follow rules of perspective and color theory. In my jewelry making classes, I was taught design principles and told that my designs were too predictable. In my communication courses, I was taught that good speeches are audience-centered. As a teenage girl in the 1970s, I was taught to please others. No one ever suggested that it was okay, a legitimate undertaking, to make something a certain way just because it pleased me. And the idea that an old farmer, a man of practical considerations and hard work, with his feet firmly planted on the ground, would find pleasure in making beauty was also a revelation. I knew old farmers; I was genetically bound to old farmers! Did old farmers feel things like that? Might I? Since I heard this story, it has informed my understanding of other makers and my understanding of myself. True craftsmen are pleased with what they create, with the skill it takes, with overcoming the difficulties of the task, with the mastery and the creating, not just of a thing but of some thing, beautiful to their eyes. So, I’ve thought hard about what pleases me and sought to make things accordingly. I’ve made a lot of different sorts of things in my life, from embroidering on my jeans as a teenager to majoring in metalsmithing in college to calligraphy to spinning to weaving. I’ve worked in polymer clay, beads, yarn, paint, silver, linen, and chocolate. Along the way, there have been many other creative outlets that moved me not at all. I’ve tried some and moved on. Others . . . just never spoke to me. These are the things I’ve been thinking about as I’ve been tempering chocolate and packaging candy these last few weeks. I’ll write more about my thoughts in the next couple of weeks, I’m sure, as my schedule calms down and my thoughts become clearer. I’m hoping, right now, that you are thinking about what you make and how it pleases you. I imagine that what pleases you is different, in some ways, than what pleases me. And yet we share the deep satisfaction of feeling fulfilled, in important ways, by the making. What aspect of your work, your craft, do you do simply because of the pleasure it brings to you? Do your days have a rhythm? Is there a predictable tempo to your hours? Or are your days spontaneous and varied dances of delight? At this time of year, my days have an undeniable rhythm, a driving tempo. Much of the day is filled with an insistent, relentless beat, as I work to make the candy I sell. The winter holidays bring busy times—people are willing to splurge on handmade candies for Thanksgiving, for Christmas, for gifts, for parties—so I’m always pretty busy in November. But this year, I’m also doing two holiday boutiques, two selling shows, where people walk by my table, taste a sample of chocolate, and buy. Last summer, when I agreed to these shows, on two consecutive days in early December, it seemed like a great idea! Right now, I can’t help but wonder what I was thinking. I know people will want to buy candy but I can’t predict just exactly which candy they will want or how much to have on hand. So, I spend my days piling boxes of chocolates up, and working obsessively to make more. 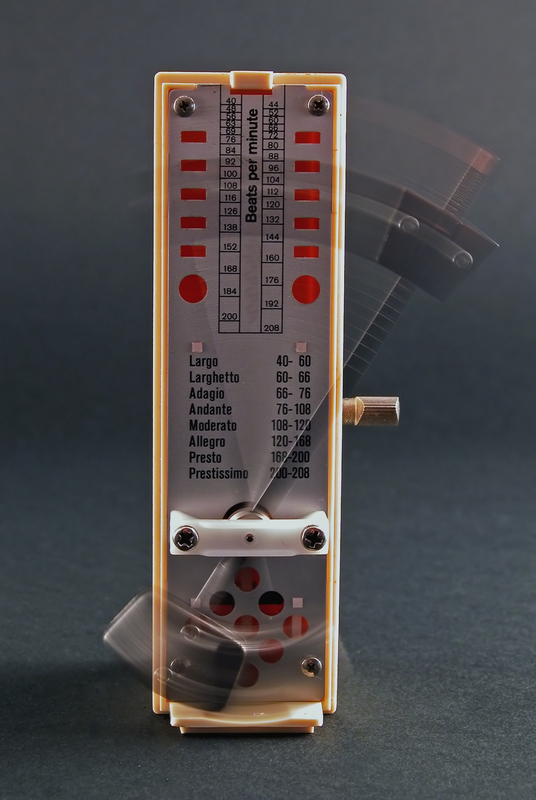 The tempos of my life right now are staccato, presto, agitato. But not first thing in the morning. I am committed to start my day, early, early, at a different pace—this is the calm before the candy. I am an early riser, usually up by 4:30. I have my ritual to begin my day. It is set to adagio and, certainly, pianissimo. I feed the cats. I give the diabetic cat an injection. I make a cup of coffee, black. I visit a set list of websites, in a set order—NBC News, the National Weather Service, the local newspaper. I write in my personal journal and have another cup of coffee, black. I take some time to visit with you, to see what you’re saying and doing. I read your thoughts and respond, as much as possible, before the rhythm changes and the day demands my participation. I love the calm before the candy. My husband sleeps a few rooms away. The cats go back to bed, too. I am alone with my thoughts. I plan what needs to be done, and everything seems possible! I know I can get so much accomplished because the day stretches out in front of me, full of open hours and promise. About 6:00, the rhythm switches to accelerato, allegro, animato. If, by this time, I haven’t taken a shower, written a blog post, finished reading yours, it probably won’t get done today. The chaos of the candy takes over, the cacophony, the movement toward crescendo. Happily, for me, this fast-paced rhythm lasts only for a month or two. January will bring a quieter time, slower tempos, with fewer demands for quick-step dancing in the kitchen. I’ll return to the rocking rhythm of hand quilting, the soothing back and forth of throwing the shuttle, and the warm, comforting slide of the iron over vintage linens. I may even fit in a spontaneous dance of delight or two! I’ll have more time for me, then, and for you. 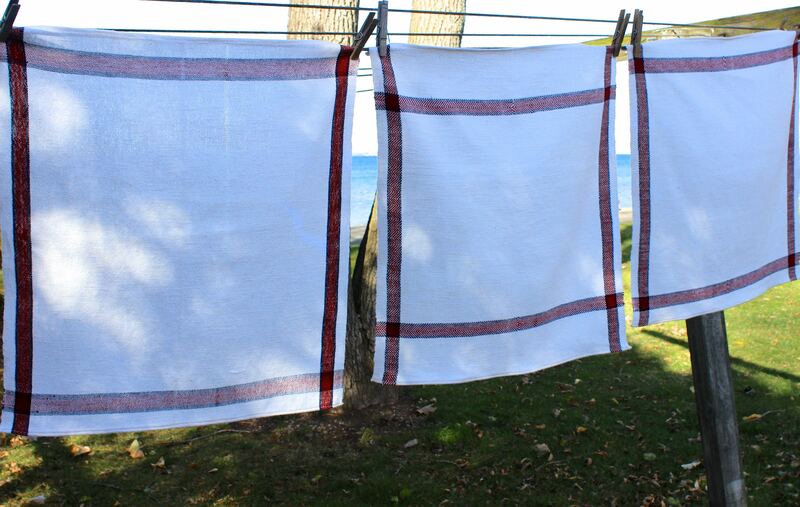 Three finished towels–and they don’t seem so imperfect at all! More information to come . . .
A girl cannot live by chocolate alone. Sometimes, frankly, she needs to remind herself that there’s a world beyond chocolate, where chocolate does not rule her every waking moment. 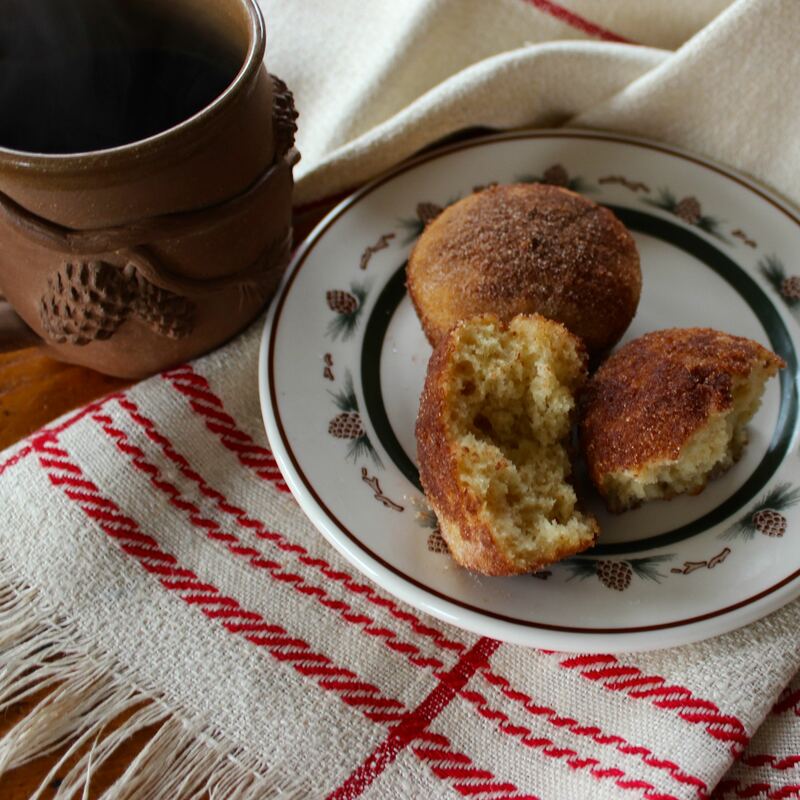 Sometimes, in the autumn, when the air is crisp with a hint of snow and the smell of wood smoke, when the geese party out in the bay and raucously plan their winter in warmer waters, and when the last leaf falls from the last tree, right then, a girl needs an apple cider doughnut. What is it about an apple cider doughnut? The doughnuts are cake-style, not yeast, so they are more dense and crumby, but still tender and light. Their sweetness comes from the apple cider used in the batter. 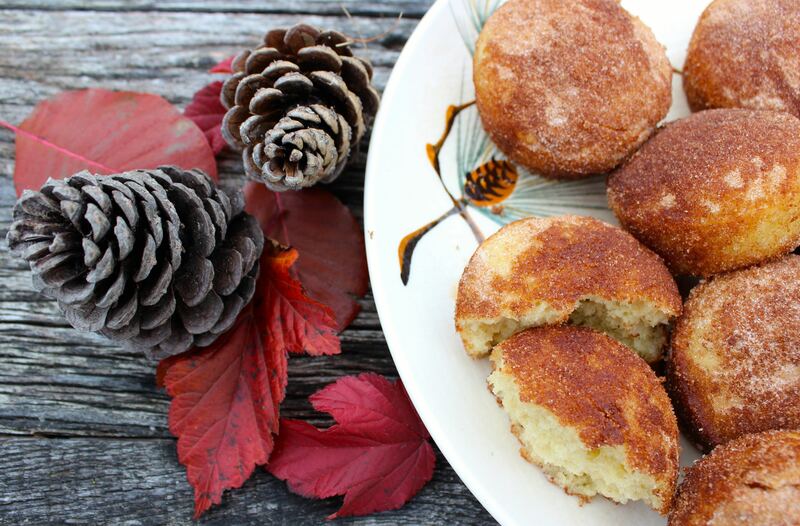 And the perfect apple cider doughnut, the one this girl craves, is slathered with cinnamon and sugar. It’s that taste and the incomparable mouth feel, really, that sets these doughnuts apart. The tender, crumby doughnut, encased in crunchy granulated sugar, warmed with lots of cinnamon. Oh, yum . . . 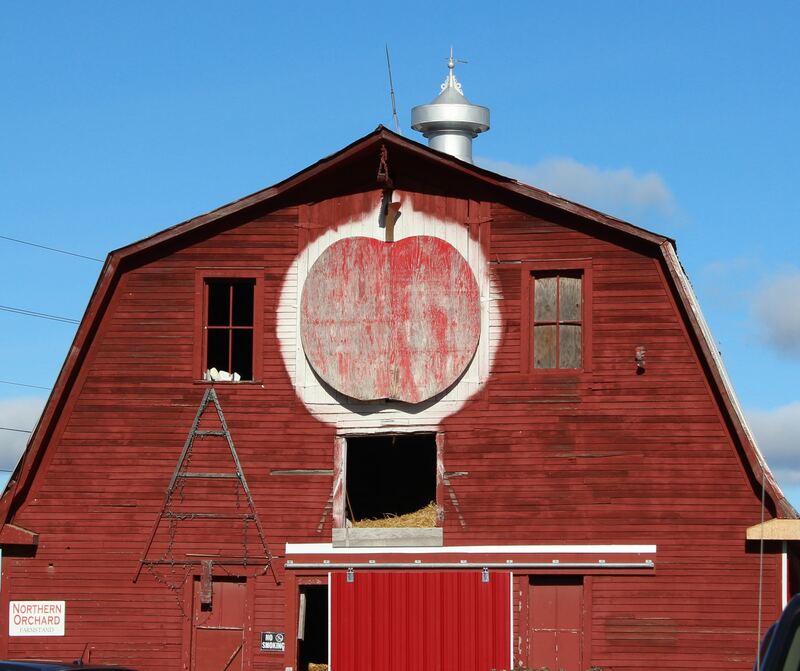 Unfortunately, my favorite apple cider doughnut is found at an orchard stand 25 miles away—it’s hard to justify taking the time to drive out there for just one doughnut. I suppose I could make doughnuts at home, as my grandmother did, but doing my own deep frying just doesn’t appeal to me. I got my fall copy of Yankee Magazine this week . 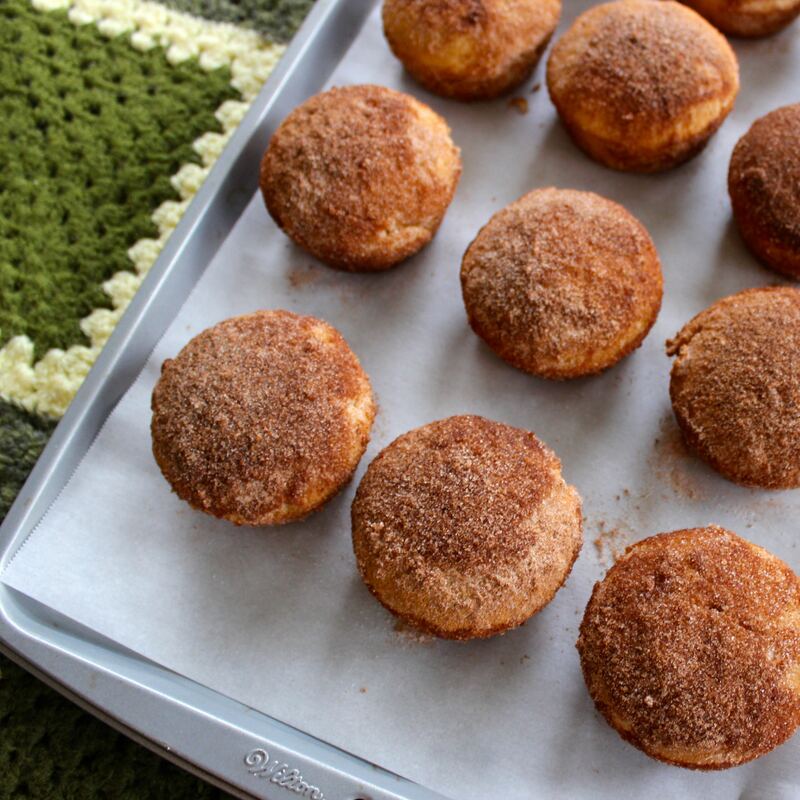 . . and saw they included a recipe for apple cider doughnut muffins! I hoped that my life had changed for the better. Yankee Magazine is the source of some of my favorite recipes, including the rhubarb pecan upside-down cake my husband makes. Still I worried whether a muffin would, could, live up to the whole apple-cider-crunchy-tender-sweet-doughnutty-goodness I love so well. Heck, yeah! These muffins nail the flavors and the mouth feel. They’re pretty easy to make and kind of messy, which adds to the fun. The kitchen smells completely and thoroughly divine while it all happens. The only thing missing is the way your tongue feels kind of oily and coated after eating a deep-fried doughnut. I’m willing to give that up. Here’s the recipe, straight from Yankee magazine, with my annotations. Preheat your oven to 375° and set a rack to the middle position. Lightly grease a standard 12-cup muffin pan and set aside. (I guess you could use muffin paper liners but you shouldn’t. First, it would lessen the surface area that cinnamon sugar can stick to and, second, real Yankees wouldn’t approve because the papers are unnecessary and, therefore, wasteful). Put the apple cider in a large saucepan over high heat and bring to a boil. Reduce the heat slightly and simmer until the liquid is reduced to 1 cup. Set aside to cool. In a medium-size bowl, whisk together the flour, nutmeg, baking powder, baking soda, and salt. Add a third of this mixture to the butter mixture and beat just to combine. Add half the reduced cider and beat to combine. Repeat with another third of the flour mixture, then the rest of the cider, then the remaining flour mixture. Divide the batter evenly among the prepared muffin cups and transfer to the oven. (I was afraid to fill the cups too full so I ended up with 15 muffins. In retrospect, I’m sure I could’ve done as the recipe said and just divided the batter into 12 muffins—they don’t rise too much). Bake until tops are firm and a tester inserted into the center comes out clean, 15 to 17 minutes. Remove from the oven and let cool 10 minutes. Now, prepare the topping (this is where it gets fun! ): In a medium-size bowl, whisk together the sugar and cinnamon. As soon as the muffins are cool enough to handle, brush their tops and sides with butter, then roll in the cinnamon sugar to coat (I threw the muffins in, top down, and used a spoon to ladle more and more cinnamon sugar over them . . . ahhhhhhhh). I really, really like these muffins! I made them two days ago and they still taste good and have a good consistency today—and that would not be true of the leftover doughnuts, as I know from experience. So, if you want to know what fall in the North Country of upstate New York tastes like, it is now in your power to find out! Let me know what you think!